This Rondeau for solo flute is taken from Michel Blavet's Premier recueil de pièces (“First collection of pieces”). 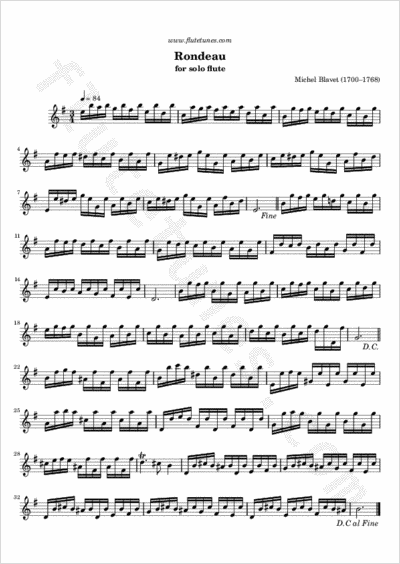 As you have probably already guessed, this piece is in rondeau (or rondo) form, that is, it is made up of a refrain and a number of episodes (only two in this case, but there could have been more). During performance, the principal theme of the refrain (A) alternates with the episodes (B, C, etc. ), creating an ABACA pattern. For obvious reasons, the refrain appears only once in the sheet music, so it's up to the performer to play the various sections in the right order.